The Log Cabin is at the North end of the island. A fine choice for those who want to quietly curl up with a book, or perhaps break out the sketch pads and painting supplies, the Log Cabin is hidden deep in the woods but only a few feet from the lake. The path to it is about 600' long and meanders through a forest of tall White Pine, and old Birch trees. 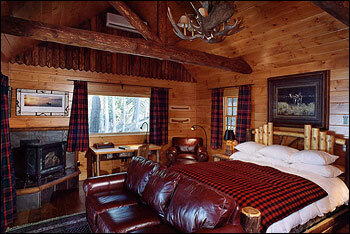 It is an ideal place to "get away" from those in the Main House. The cabin is extremely quiet and you hear only the gentle whisper of the wind along with the hypnotic lapping of the waves a few feet from your door. You can dine in the cabin but will probably decide to join the rest of the gang in the Main House, for dinner and activities. After dinner, you can sneak off to your private place in the woods. There is a lighted path to get you back to the cabin but keep in mind that it is rustic. 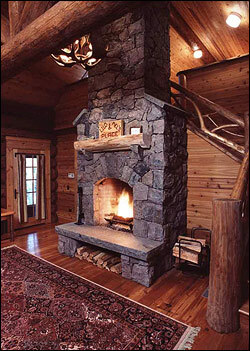 There is a wood burning fireplace in the living room, and a separate one in the Master Bedroom. The cool nights are even more enjoyable as you fall asleep listening to the gentle crackle of the aged wood logs. All the wood used is from trees that have fallen down on the island. Special attention is paid to conservation and preservation. The island is not a commercial hotel. Rather, we are a private family compound that is to be preserved for future generations. We will gladly hang pictures of your family and put out your photo albums from each of your visits. Your children and grandchildren may return one day and find everything as it was when they were little. To view more photos please join us at the Log Cabin Gallery.